My Oh My, I Love Pizza Pie…..
Good Late Thursday Night! I am anxious to jump into bed but first feast your eyes on a fabulous pizza pie! My pizza pie was inspired by my favorite “Mall Food” at the food court, Sbarros Pizzaria. I have so many memories eating at Sbarros from my many pre-teen mall outings to my most recent memory with my sister in NY. We wanted so badly to eat at a really nice restaurant before going to see Legally Blonde, and guess where we ended up eating instead?…. Yup, good ol’ Sbarros! (thanks to our late taxi!) No matter how many pizza choices they have to offer, I always end up going with the stuffed “white” pizza with spinach and broccoli. A couple nights ago I had all the ingredients to whip up my own version and I was in hog heaven. I made it late night and ate a couple pieces all by myself. My 3 year old even shared it with me the next day for lunch. 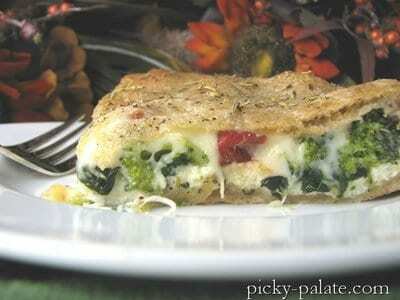 Perfect way to hide those veggies, just dredge it in a little ranch and they’ll never know! Go buy or make yourself some whole wheat pizza dough so you don’t feel so guilty. Oh and don’t forget the part skim ricotta! No matter how many calories, work it off later. Indulge in a little food court heaven, the pizza pie! 1. Preheat oven to 375 degrees F. Divide dough into 2 equal pieces. Spread and press one piece of dough into the bottom and sides of a 9-9 ½ inch round cake or tart pan that has been sprayed with non-stick cooking spray. (I used a 9 ½ inch deep quiche pan with a removable bottom that worked perfectly) In a medium bowl, mix together the ricotta and parmesan cheese until well combined. Spread into pressed pizza dough. 2. Place olive oil into a medium skillet over medium heat. Saute spinach until wilted down, about 3 minutes. Place evenly over ricotta cheese layer. Place steamed broccoli florets over spinach and season with a pinch or two of kosher salt. 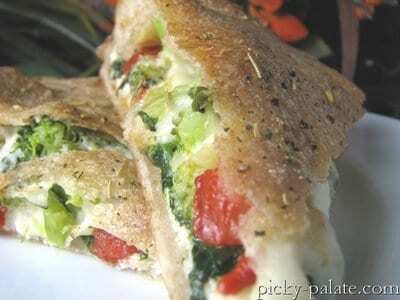 Layer roasted red peppers, then mozzarella cheese over top. Press out remaining piece of dough and place over filling, tucking edges inside of pan. Brush with olive oil and sprinkle with Italian Seasoning. Bake for 25-35 minutes or until crust is golden brown and cooked through. 3. Let cool for 10 minutes before removing from pan or cutting into wedges. My oh my Jenny this looks delicious! What a great way to eat veggies! That whole wheat crust sounds great. Wish there was a Trader Joes nearby. My favorite mall food is Chick-fil-A. This looks totally indulgent for me. I’d like a huge slice, then a few of those chocolate oreos below. That’s all I need in life to make me happy. I can’t wait to try this one. to 4:28am, I was thinking the exact same thing. I have just got to try those oreos, and I plan on taking them to a Halloween party. That should be a conversation piece. I just love this website. Oh yea, I love chick-fil=a too. Now I’m craving me a trip. Oh you got me here…this looks fantastic! Love love love stuffed pizzas! Everything you stuffed in there looks delicious! Looks delcious! We are making pizza tonight. How were you able to roll such a nice thin crust? Wow Jenny your pizza looks fantastic…I’m drooling on my keyboard! I’d have these veggis any time in this pizza! I love chick fil a too. So do my boys! I’d be happy with that too! Hope the Oreos are a huge hit at your party! Lots of pulling and letting come to room temp. This looks like it will have to be dinner this weekend, or at least some good grub during the Charger’s game on Sunday! 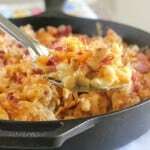 What an easy, yummy dish! Fave mall food for me is this place called Tacone Wraps. Great, interestingly flavored wraps. I like the turkey/cranberry one w/ a side of sweet potato fries! My fav. mall food: Strawberry Pina Coloada Hawaiian Shaved Ice with cream on top. Yum! Its only 9:44 AM here and I want to eat lunch already! This looks really delicious! Stumbled! This looks fabulous Jenny! I LOVE chick-fil-a. It’s the only thing I’ll eat at the mall. My mall just put in a Taco Bell, is that crazy or what? Great post for the upcoming weekend! I love spinach on pizza even though my husband thinks it’s strange. Haven’t tried the brocccoli on there, but sounds yummy. At least being fully loaded with veggies I don’t feel as guilty about eating pizza. Sheesh Lorie, your mall food sounds terrific. Lucky! I love that hawaiian ice too. My boys and I are at chick fil a at least once a week. They opened a restaurant right by our house. Yes, the veggies help the conscience! YUMMY! that looks great! I love charlies cheese steaks, and the Italian panini from Frullati Cafe. Thanks again for another great recipe. Jenny you have me drooling here, seriously this looks fantastic! I love pizza, I NEED to make this!!! That looks deelish! Mall food… I honestly rarely go to the mall since I’m more of an online shopper but I used to love a soft pretzel with honey mustard. love sbarro’s. brings back memories for me, too. 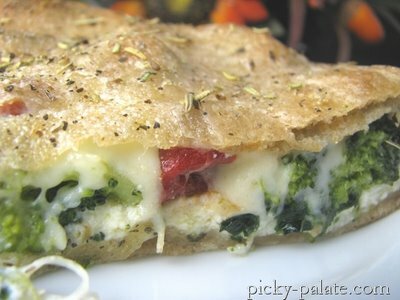 I love a white pie — I always went for spinach and ricotta. cannot wait to try this. yum! Looks fantastic! I love the white sauce and adding the fresh veggies is perfect. Don’t you love TJ’s whole wheat crust…it’s so good. I love pizza pie too-and oh do I remember Sbarro’s….it was the place my daughter Robin and I hit every trip to the mall! I make pizza every Friday night-but it sure doesn’t look like this! Will have to look for the whole wheat pizza crust when I’m at the grocery store next week…if I can’t find it, I’ll make my own. Yes Ma’am, Ms. Jenny-I’ll be making this soon!!!! Umm I always want one of those big cookies with the frosting on it. Soooo good. But I never get it! I love your blog by the way! That is the healthiest looking pizza I have come across in a long time. Looks delicious! Have a good weekend, Jenny! I haven’t had a stuffed pizza in ages!! And I have to say, I’ve been seriously craving a soft pretzel from the mall – I just may have to stop on my way home today! Ok, I have to say that I LOVE your yummy recipes!! I love coming to your website and trying your creative ideas!! I also had to make a rule for myself that I can only bake 2 yummy treats a month because it’s all going straight to my hips! AND the fact that you got to see Legally Blonde in NYC makes me completely jealous, I totally watched the search for the next Elle Woods on MTV–as if I had nothing better to do!! Oh Jenny, you & I have the same taste when it comes to pizza. This is what I would order at Sbarro's. I always opt for the white sauce versions with spinach. And this looks awesome. Going on the list. I love your Pizza Pie. I confess…I love Sbarro as well. It’s even better in New York! That looks so delicious! I love Sbarro’s too when I’m at the mall. Yum! I love pizza, and I love savory pies. I never would have thought to combine the two, but it looks fantastic. I never eat at the mall so I can’t tell you, but your pizza looks to die for! I love all of the veggies! I so seriously need to stop reading your blog at work! My poor boss is always mopping up my drool. This looks divine & I think I can get all 3 boys + the man child to eat it. As for my fav mall food…now, nothing, back in the day (you know prechild) it was Cookies from the Cookie Factory. This really looks fabulous. I have to admit if the mall has Chik-fil-a, that is it.That is one of the main things I miss about living in Georgia-there they are everywhere! Here it is impossible to find one within an hours’ distance! This pizza is one that I have had before and I really liked it. Great job on recreating this, it looks so delicious! My favorite mall food??? It was from Taco Viva(no longer in business), it was their “Wet Taco”. Ohhh that looks right up my alley. I love pizza. That is totally by far the best mall food. I’ll have a slice please!! This looks deliciois!! Lowen would love it and not even realise all those hiding veggies!! Great to hear from everyone. Love to hear everyone’s favorite mall food. Look like chick fil a is in the lead! I have to admit, as gross as it sounds, I love mall “chinese” food. Grease and all! The samples of bourbon chicken always pull me in….it’s a good thing I only go to the mall once a year or less! Being from Chicago, stuffed pizza is the only way to go. I usually make a large double crust pizza in a traditional thick crust pizza pan. I love that your recipe uses a 9 inch pan. So funny! Sbarros TOTALLY reminds me of hangin’ out at the mall with my girlfriends in High School. Love it! That’s my favorite kind too though. Yours even looks better than theirs and I’m sure yours wasn’t sitting under heat lamps all day either. Makes me crave it right now! Although, I have to admit Sbarros is a toss up with Auntie Anne’s soft pretzels when I’m at the food court. By the way, my sister just told me that you are in her stake. I’m going to her house for Thanksgiving so would you mind if I stopped by for a sample of, umm, how about everything you make? Thanks! Small world though, huh! This looks great! I certainly have had my share of mall food…Panda Express, Chick-fil-A, Sbarro come to mind! Your pizza pie looks so delicious! And thanks for visiting my blog. I’m excited to read about your adventures too! that looks like a great, savory pie! hey you might be interested in this new blogging event – i saw it and thought of you b/c you are always so creative! My favorite is Chick-Fil-A. Gotta admit I had it twice this week. I am sitting here watching baseball with the husband and show him your pizza I want to make Sunday & he said, "If I ever meet her, I am going to hug her"! It was funny because the only time I cook is when I use your recipes. He is so thankful for your talent. This is my first visit to your blog and I can’t WAIT to try some of your recipes! I’m a Chick-Fil-A girl. Too bad I can’t get it in San Francisco! That is my favorite Sbarro pizza! It looks great! It has lots of vegetables in it. Well, I used to like Cinnabons at the mall, but then Cinnabon left. Sooo, I guess I like Auntie Anne’s pretzels. I just jumped into your blog and I am hooked! My friend who is an amazing cook, sent me your way. Thanks for recomending the whole wheat crust version, I’m trying to eat more healthy these days (lose weight UGH!) and I was not even going to try your recipe then I read your idea. We don’t have a Trader Joe’s nearby either. Oh well, we will figure the crust out. 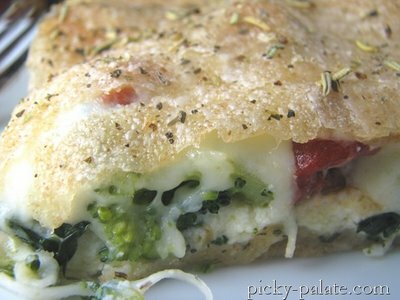 I love pizza pie and the veggies sound wonderful (not to mention great pics!) The OREO cookie, yumminess may have to enter this girls menu at some point! 🙂 Mall food? Orange Julius and Greek Gyros. MMMMM! How easy is that? God this looks so good!